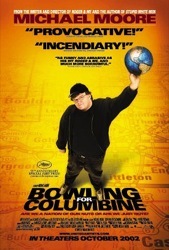 Michael Moore searches America (and Canada) for an answer to the question of why there are so many gun murders in the US. As a card-caring, gun-toting NRA member Moore reveals this quest to be more complex than you’d might expected. Always the coyote trickster, Moore investigates with great entertainment, and does here what he does best, pressing hard when people try to squirm out of honest answers. For a subject that should be ponderously serious and somber, this is a subtle, surreal and funny trip, and one that can change your mind.